These inspirational shorts showcase what women are doing in and out of the water for the betterment of society. Directed by Chris McClean. 2017. UK. 2 min. Poetry and visuals combine in this sublime short film. Directed by Mègane Murgia. 2018. France. 15 min. French with English subtitles. A group of women find inspiration on their surf travels in warm water locals around the world. Directed by Leah Dawson. 2018. USA. 21 min. 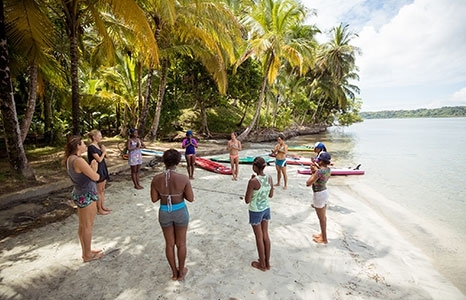 On a small island in Bocas Del Toro, Panama, opportunities for young women are faint. Sports, activities, and education are often dominated by male participation, and teenage girls are expected to follow the local norm of getting pregnant or staying at home as caretakers. The Changing Tides Foundation teamed up with Give & Surf to create a program called WOMP (Women's Outreach Mentorship Program). WOMP donates gear and for one week, teaches stand-up paddling, snorkeling, and surfing in attempts to change the status quo for the young girls of Boas Del Toro. Directed by Katie Walsh. 2018. USA. 31 min. Surfing to Cope is a personal tale of Brianna Cope as she strives to make the World Championship Tour while coming to terms with a physical challenge that has shaped her life. July 10 at 7:30pm: Please join us for a Q+A with Changing Tides Foundation's Jianca Lazarus. Born in Johannesburg and raised in Cape Town, South Africa, Jianca Lazarus learned to surf and picked up her first camera at 16. With six group shows and four solo shows under her belt, she now flies across the globe like a bedouin photographer, dividing her time between New York, Hawaii, along with quick trips to El Salvador and wherever else catches her fancy. Raised in the split culture of South Africa, Jianca is fascinated by the world's cultures and diversity on land and at sea, from deep water surfing in El Zonte to the dusty colorful streets in the township of Guguletu. Going from one project to another she was astonished at the daily plastic consumption, eco-destruction and human instability that presented it'self through her camera lens. Enamored by people that had nothing but emotionally presented so much strength, she co-founded the non-profit organization Changing Tides Foundation with six other like-minded people that wanted to create impactful change.